The Greek word used in verse 34 by Mark, translated as compassion is splagchnizomai (splangkh-nid’-zom-ahee). It means something like to be moved deeply in the guts. Here is a deep visceral reaction in Jesus, one without thought, a reaction of human and divine solidarity with the sick, the powerless, the suffering. In this reaction is the revelation that the divine life is completely, fully committed to the human experience – with us, healing, saving, and empowering us to live a life in the simple freedom of the loving present moment. In this Gospel story struggling humanity experiences, in Jesus, the God life. And this is how it is with us today. In our contemplative practice we too experience God in Jesus. We experience Christ consciousness. In this experience, in ways mysterious, the struggles of our inward human lives are healed, saved, transformed. We experience in Christ an ontological union, or a union of being between human and divine life, the same union of being that Mark has Jesus acting from in tonight’s Gospel. In the risen Jesus human and divine life are fully present to, and alive in each other. Christian prayer is about learning to be more and more present, more and more attentive, to this union of being within us. To give attention to this union requires solitude. The Gospel for today has Jesus going with his disciples to a deserted place to rest, a place of solitude. The more we practice prayer the more we discover that this solitude, this deserted place of rest, is within us, within our own hearts. On the way into this deserted place we experience our inner struggles, those things within that, like the crowd in the Gospel, can demand our attention on this journey into solitude. And just like in the Gospel, these struggles – be they struggles with distractions or struggles with deeper psychological wounds (wounds that can sometimes be at the root of our distraction) – when these struggles come into contact with the divine life they are (over time) healed. It is very difficult to go on this journey into solitude alone. The disciples, in the Gospel, did it together, with Jesus. Thankfully, it is possible to experience our own unique solitude in God together. In this experience we also experience our struggles and healing together. This together into solitude and struggle, so that healing happens and Christ may be lived and experienced, is just one part of the dynamic of Christian community. In the decision to be together and to embrace our solitude together, in the experience of a practical giving and receiving of love for each other, and in the commitment to a common prayer life which transcends egocentricity so that we may be more in love together – it is in the practice of these things together where Christian community is born and lived. I experienced this threefold dynamic at Mediatio House. This dynamic can be, at times, an uncomfortable, even painful experience. And it’s also an experience that has within it great purpose, meaning, and fulfilment. The commitment to hospitality at Mediatio House is a very practical way in which we, at the house, grow in other centred loving. People come to the house all the time: to pray with the community, for day activities, for lunch, meetings, accommodation. Our challenge is to be and become people of welcome, to be present to the people who come to the house, to give them our attention. People from all over the globe come to the house to live. This can be for a few weeks, to 6 months, to 12 months and beyond. In this experience there are cultural challenges as well as challenges of personality and temperament. …community always means the collision of egos. It is less like utopia than like a crucible or a refiner’s fire. In this process God wants us to learn something about ourselves, our limits, our need for others. In this process is the pain of not getting our way, but the promise of finding the Way. There have been times in the last 12 months where I have experienced this collision of my ego and other egos. I have been involved in heated discussions around how I and others have been living with each other. I have witnessed the struggle of fellow members as they discover through experience the deep seated ways in which the human reaction of self-preservation via isolation can flare. I have discovered myself sitting in judgement of another’s controlling and anxious ways only to discover that under my judgement is a denial of the ways I tend towards the control of others so that I may not experience anxiety. I have experienced the ebb and flow, the back and forth, of humility and pride. My pride says ‘I can do this myself’, it says ‘I don’t require relationship’. It develops in isolation, both physical and psychological. It often grows subtly, quietly. Or it can spring up in reaction to someone’s critique about the way I am living, or not living. Unchecked it grows into arrogance. When I am in the midst of it I am caught in the illusion that God is absent. There comes a point in all of this when the experience of isolation becomes prominent enough for me to be honest about it – with myself, with God, with others. In the eventual turn back to community and relationship is the turn back to grace and the realisation that I need God and that community (where ever I am experiencing it) is a vital part of the way to God. In this realisation humility grows its roots a little deeper. My time at Meditatio House has been a humbling experience. Humility is pride’s antidote. Only a life growing in humility can truly grow in God. At the centre of all of this was (and is) the three times a day of prayer and meditation. At these times we gathered together as a community with whatever was going on within and between us. At these times we practiced attention off any struggles that were going on and attention on the divine life within. We were like the crowd in Mark’s Gospel – focusing on the presence Christ. Looking back, during these times I experienced the forgetting of struggle and the silent emergence of healing and integration. This emergence would not have happened in the same way if I was living by myself and meditating by myself. We all need crucibles, a refiner’s fire. Community is mine. And as this emerging happened I discovered in myself a slow growing acceptance of fellow community members. I discovered myself living in a love for them that I did not have to make happen. I could let go. We grew in simply being with each other. So what about Benedictus and this threefold dynamic of solitude together, practical giving in love, and communal prayer? Solitude and together: Our service each week in an example of being both together (at the service) and in solitude together (as we spend time in silence within the service). We come and experience God alone and together. Our times of commitment to contemplative prayer outside of this service are also done together and alone. Practical giving in love: Acts of service for the Benedictus community, as well as for those who form a part of our communal experience generally (partners, family, work, friends) – these acts can reveal us to ourselves. Attention to our inner lives can help us to see our motivations for giving and living as they happen within our commitments. This practical giving is an act of self-giving: things here such as the centrepiece, wine and cheese, staying just a little longer after the service to say hello to people we may not know yet. We also know about the practicality, the effort, and self offering of loving and being loved by a partner, family, and friends. 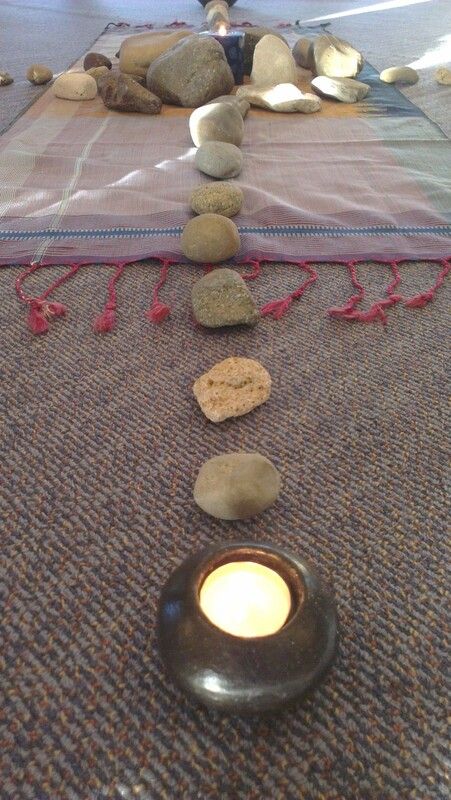 Communal prayer: This service is our communal prayer. The silence at its heart is the place in which we are growing in the giving of our whole selves to the divine energy at the heart of Creation which sustains us for loving and integrates ego with Self. After this silence our inner lives are freed just that little bit more to be in love with ourselves and each other. At Meditatio House, as a residential community encouraging others to grow in love and Self, the volume is turned up on this three fold dynamic. It’s a bit like living in a hot house. The volume is turned up on a dynamic which is already a part of any life committed to growing in love and prayer together. On this loving, contemplative, and communal journey we are all on, where ever we are on it, what is happening is that our whole humanity is growing into a union with the divine life. Jesus shows us that this growing in union is possible. His risen life with and in us is the way divinity comes alive in us and the way we come alive in the divine life. This entry was posted on Thursday, August 6th, 2015 at 2:56 pm	and tagged with Benedictus Contemplative Church, Christian Spirituality, Community, Contemplation, contemplative experience, Ego, hospitality, Meditatio House, Meditation, Parker J. Palmer, WCCM, World Community for Christian Meditation and posted in First Published Elsewhere, Religion and Spirituality. You can follow any responses to this entry through the RSS 2.0 feed.